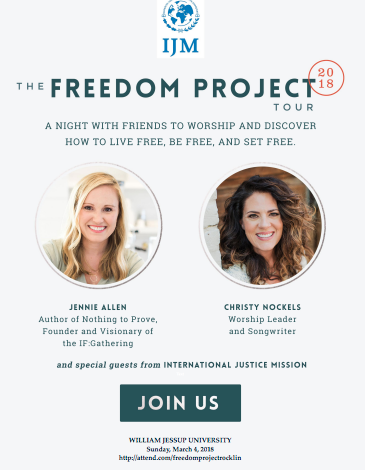 The Freedom Project Tour, a wonderful evening of worship and teaching with creator and founder of the women’s conference, IF: Gathering, Jennie Allen. She will be joined by worship artist, Christy Nockels, along with International Justice Mission and Noonday. Click here to register to attend the event. Click here to register to volunteer.